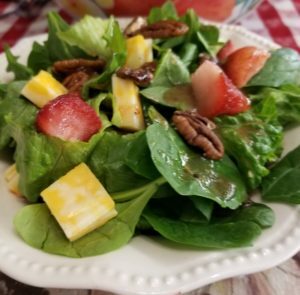 NOTE: This salad is not only beautiful, but crunchy with candied pecans and fresh strawberries. 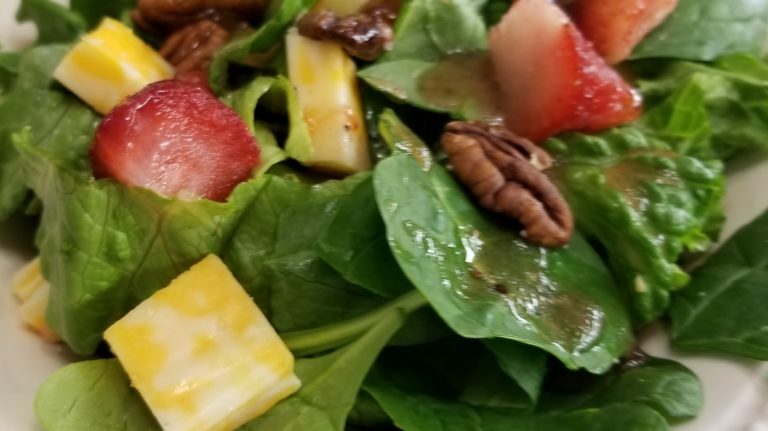 The Strawberry Vinaigrette sends this salad over the top. Place pecans in dry skillet with sugar. Toast pecans until they become sugar-coated, about 3 minutes. Remove to wax paper to cool. Place chopped lettuce and spinach leaves in a large glass bowl. Add green onions, strawberries, and Sugar-Coated Pecans; toss together. Scatter cheese cubes over top and toss throughout salad. Make Strawberry Vinaigrette Dressing by combining the olive oil, vinegar, strawberry preserves, salt, and pepper into a jar with lid. Shake dressing well. Pour dressing onto salad, letting it seep down through the leaves. Serve with crackers of your choice. Delicious! Serves 8 to 10. NOTE: Place strawberry preserves in microwave for one minute to soften.